Journalist never spares a chance to add extra masala to their stories when it comes to celebrities. Here celebrities yawn and there a completely fabricated story gets published. During interviews, reporters grill the celebrities by shooting unpleasant questions to them. But wait, this universal truth gets diverted when it comes to SRK. SRK knows all those mantras which could outrun the questions of reporters. Be it a movie launch or a friendly candid chat show, whenever these two come in contact, audience witnesses humor and much more! SRK witty answers awestruck reporters and moreover this is one of the reasons he is loved by almost all the top journalists. When a reporter asked him, “When will he start making different movies”? SRK decided to play the same game on the reporter and asked him instead, “When will you start asking different questions, better questions?” His answered compelled all to clap. 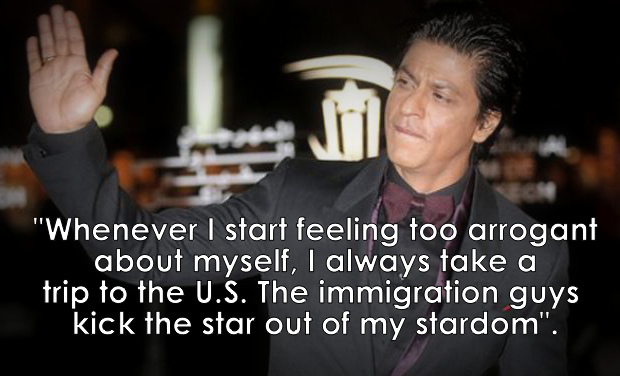 His statement that “Whenever I start feeling arrogant about myself, I visit U.S, the immigration guy kicks out the star in my stardom” on the US airport controversy, proved that he is wittiest of all. On being asked by the reporter that “Why you always keep saying that you are the best?, His answers that “ If I will start doubting this fact, then who else will believe?” was very inspiring and a hard blow to all those who criticize him for loving himself. Once a female reporter asked about his payment, he very smartly ran from question by warning the lady that another such question and I will ask your age! He just got out of the cage! A reporter in order to increase the readership of his magazine, he very smartly asked SRK “What if you wake up as Karan Johar?” SRK hit back hard and replies that he wishes to wake up with Karan instead of as Karan Johar. Even Karan Johar appreciated his answer. “I don’t write cheques anymore, because I end up signing them”. His statements like this make us feel that yes we are proud to be SRK fan. He is a man of wealth and value in the society. Who says being Narcissistic is a bad thing? SRK very well knows how to make narcissism mild and adorable. “If I would not have been Shah Rukh Khan, I would have been the one wanting to be Shah Rukh Khan” shows that even praising yourself can be sweet. Shah Rukh Khan is not just a name but has become a trend. People has always loved him and given full marks for his attitudes. Not only on screen but he has been entertaining all of us off-screen too with his witty answers.